I can't believe it's Friday already. Where in the world has my week gone? I have a to-do list on the fridge that I made the night we got back from Dallas... pretty sure I've only half-way completed one of the things on it, and that's clean the house. And if by clean the house you mean vacuum Brayden's room and the living room and have it somewhat organized, then I accomplished that feat. Otherwise, you can call this week a wash and we can all hope that next week is far more productive. Tonight I leave for Little Rock... by myself. It's the first time I will have left Brayden alone with Daddy for more than just an hour or two. He's more than capable, but it does make me a little nervous because men just don't have the instincts women do when it comes to dealing with kids. As for me, I am helping throw a shower on Saturday for a good friend, and didn't really think bringing my toddler was going to make it a productive trip. I'm really excited about seeing all of my friends, and enjoying some time to talk and catch up without all of us having to run after little ones. I grew up in a small group with 8 girls in Little Rock, and out of those 8, 5 of us are pregnant and all due between November and March. You'll be sure to find some belly shots of all of us together from this weeekend on weekend to review. And for the record, Katie, the girl we're throwing the shower for, is the only one yet out of all 8 of us to be having a girl. Steph is pregnant with boy #3, Court is pregnant with boy #3, I am pregnant with boy #2, Amanda has a boy (she is due in March so hasn't found out what she's having yet) and Katie T. has a little boy. Goodness gracious! Boys galore! With it being Friday I guess I should probably hop on into the 5QF questions. They are kind of hard this week, so I don't know how spectacular my answers will be, but I'll jump in nonetheless. Sometimes. But sometimes not. I think it depends on how expensive it is. If it's, say, a Sonic drink, then no. I find that those kind of calm me down and are my mommy moment heavens. I am sure if you have children you'll agree. But if it's big ticket items, I'll dream, covet, drool over and oogle at all things technologically advanced, but rarely if ever do I spend the money to get those things. I have babies to dress and people to feed around here folks. Well enough to yell obscenities when their pit bulls try to clear our fence or snarl at my son and dog (and don't look down your brow at me for the yelling, or the obscenities part. I'm pretty sure if you're a momma-- to a fur baby or a real baby-- that if their safety is on the line you'd yell what comes to your mind first too). Oh wait, that doesn't count? Perhaps well enough to call the city council on them after they try to build a makeshift chicken coop off of their house and their roosters crow one too many times (have I mentioned I live in a track home neighborhood where houses are literally feet from each other?). Oh, er, that doesn't count either. Hmmm. Then I guess it's safe to say that my immediate neighbors really don't know us that well, nor we them. Which is kind of sad seeing how we live so closely. But as you can tell, we are a little, um, how shall I say this, different (or they are different from us... haven't quite figured that one out yet!) and tend to do things by the book around here. I think it's safe to say all of the ages that I look(ed) forward to being have sadly passed. I looked forward to being 16 so I could drive. I looked forward to being 18 so I could vote. I looked forward to being 21 so I could drink. I hit 25 and my body failed me. Literally. At 25 I went the doctor more times than I want to remember. I do look forward to being retired with Drew. We have so much fun together traveling and exploring. Yes! And I have no idea why because more often than not the mailbox is just filled with bills and junk mail. This is a hard one because it's not like I have one memory that sticks out at me as my "first" memory. I would say that I can go as far back as the apartment we lived in when I was about 2 or 3. I remember not sleeping during my naps, and I would hang upside down on the side of my bed. I remember the apartment upside down because of this. So I guess that would be it, but who knows really. 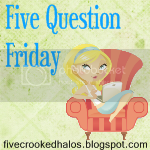 If you'd like to participate in 5QF, just hop on over to Mama M.'s to get all the details! Have a great weekend!